On the sparsely populated islands of the Outer Hebrides there are very few place names and on the OS maps these are in Gaelic. To enable us to check where an observation was made it is important for us to have a grid reference taken from an Ordnance Survey (OS) map or a GPS device. The OS maps for Great Britain are divided into a grid of 100km x 100km squares, each with an individual two letter reference prefix. For the Outer Hebrides these are NA, NB, NF, NG, NL and HW and can be found in the corners of OS maps. The numbers of a grid reference identify a location within a 100km square. The first two numbers are the distance east from the western edge of the 100km square and the next two give the distance north from the southern edge of the 100km square. Many biological recorders use hand-held GPS devices or apps on smart phones to record the grid references for their observerations. However, it is also useful to be able to read a grid reference from a map. You can find clear instructions on the Ordnance Survey website. If you do not have the correct Ordnance Survey map or are not confident in your ability to calculate the grid reference, we have provided an on-line grid reference finder for the Outer Hebrides produced by Ordnance Survey. 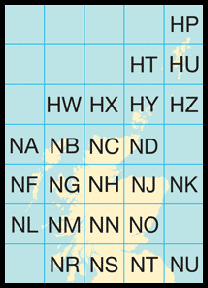 Find a Grid Reference in the Outer Hebrides.